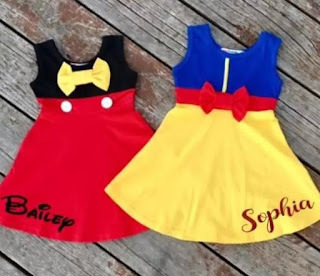 Check out these *POPULAR* Custom Princess Dresses | 12 Options $15.99 (Retail $42.99). Custom Princess Dresses - These super cute princess inspired dresses are perfect for all the little girlies in your life. They are perfect for visiting theme parks, birthday parties, playing dress up or just hanging around the house. Each dress is embellished with your favorite princess' signature colors and accessories. Customize with child's name in glitter print and your choice of 3 fonts. Choose a different dress for each day! $3.99 for the first item and $1.00 for each additional item. US only. Ships no later than Mon, Apr 23.